Too much Donald Trump on your Internet? There's an add-on for that. A new Google Chrome add-on allows users to eliminate mentions and photos of the Republican presidential candidate online -- essentially creating a Trump-free internet. 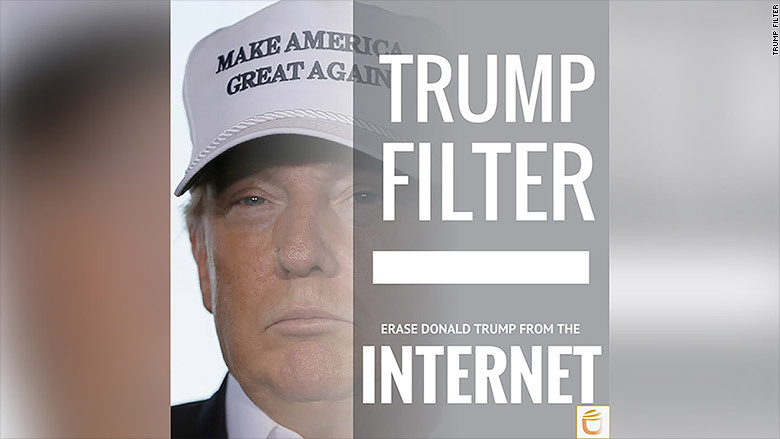 A description of the Trump Filter extension says it's part of the "antidote" for Trump's "toxic candidacy." "I hope folks will take this opportunity to learn more about the wide field of candidates out there," Spectre told CNNMoney. "People are looking to turn him off," Spectre said. With the Trump Filter they can. The extension comes preset on mild, which is still fairly strong -- Donald Trump's entire Twitter page goes blank. On the highest setting, vindictive, entire news sites are blocked -- CNN, Google News and even InStyle go blank.